What is Excursus and how did it come about? Excursus was a two-year, four-part initiative at the Institute of Contemporary Art, University of Pennsylvania in Philadelphia positioned at the intersection of art and design, programs and exhibitions, and the archive and the museum. It took the form of a rotating installation on the ICA mezzanine, a curated series of intimate events, and an online residency on the Excursus website, which also acted as a form of real-time documentation. 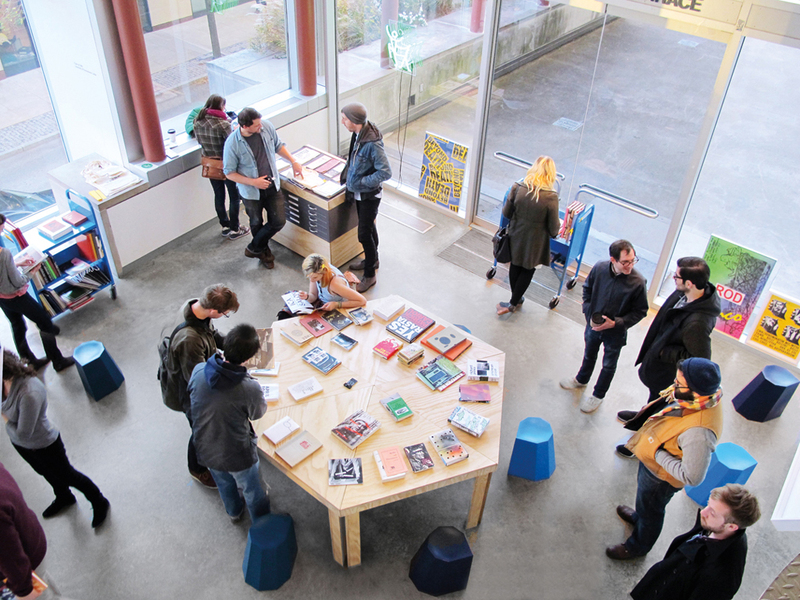 Each of the four invited participants— Reference Library, East of Borneo, Ooga Booga, and Primary Information—work in a space between artistic domains that don’t always have a comfortable place within a traditional gallery setting, such as publication, distribution, archival research, and programming. Alex was hired in 2011 as ICA’s newly-created program curator, and Excursus was a way to explore and activate the “discursive space” of the museum as it approached it’s 50th anniversary and to challenge the notion of how a program could function and how we might gauge its success. ICA is a non-collecting institution with a long history of ground-breaking exhibitions—Andy Warhol, Paul Thek, and Martin Kippenberger each had their first U.S. solo museum shows at ICA, for example—and thus ICA’s extensive archive is in a very real sense its collection. Each of the participants was thus invited to delve into the ICA archive and to make connections both with their own concerns and the exhibitions currently on view in the main galleries. An “excursus” is a literary term describing a digression or supplement to a primary text, and the project was conceived very much in that spirit, with every element, from the installation to the programming, emerging from these conceptual and material connections. The aim was to provide a platform that could be responsive and flexible–both in terms of form and authorship–and that could could bridge the gap between extra-institutional and institutional activities while still maintaining a strong framework and a grounding in the physical space of the ICA. The project has a very strong design sensibility, from the participants selected, to the design of the space, to the design of the ephemera, and of course the catalogue. Was there a philosophy at work behind the design of the whole program? Certain binaries seemed to anchor each season of the project: East Coast vs. West Coast, black-and-white vs. color, social vs. contemplative, etc. Although each iteration of the project revolved around a kind of kit of parts–a flexible space for discussion, a display system for the event broadsides, a set of flat file drawers to display archival material, an auratic object of some kind, and a projection in the lobby–each of the invited participants contributed a strong visual aesthetic that was linked to the thematic of each of their installations. Thus, the form of each installation, from the materials used to the seating and furniture, reflected a distinct sensibility that changed radically from project to project and sat apart from the rest of the museum identity and the exhibitions in the main galleries. For example, Reference Library’s Andy Beach used custom-designed furniture in unpainted wood in combination with Martino Gamper’s bright plastic Arnold Circus stools in shades of blue and a Wharton Esherick Hammer Handle Chair on loan from the Hedgerow Theater in nearby Rose Valley. This then gave way to East of Borneo‘s exploration of California arts pedagogy circa 1970 with seminar tables, vintage David Rowland 40/4 chairs in period colors, and an actual Metamorphokit table, designed by Peter de Bretteville and Toby Cowan, shipped directly from the CalArts library. For her installation Ooga Booga’s Wendy Yao recreated the unmistakable look and feel of her two Los Angeles stores, complete with a hammock, bookshelves, and a custom table and benches designed by Manuel Raeder, which are now installed at her Mission Road space. Finally, Primary Information drew inspiration from ICA’s seminal 1975 Video Art exhibition with a more spare, conceptualist, black-and-white aesthetic, punctuated by Sarah Crowner’s dramatic Vidas Perfectas curtain (2011), originally produced for a Robert Ashley performance, which created a literal backdrop for the activities that ensued. In this way, the design of the projects themselves marked out a distinct physical space that was at once rich with material and metaphor, but also flexible and open. How did the graphic identity for the project come together? To serve as a frame for the four installations the Excursus identity took the form of a diagrammatic mark that served to describe a set of relationships — between Art, Design, Archive, and Conversation — that summed up the matrix of concerns that shaped the project rather than a wholly separate visual language. 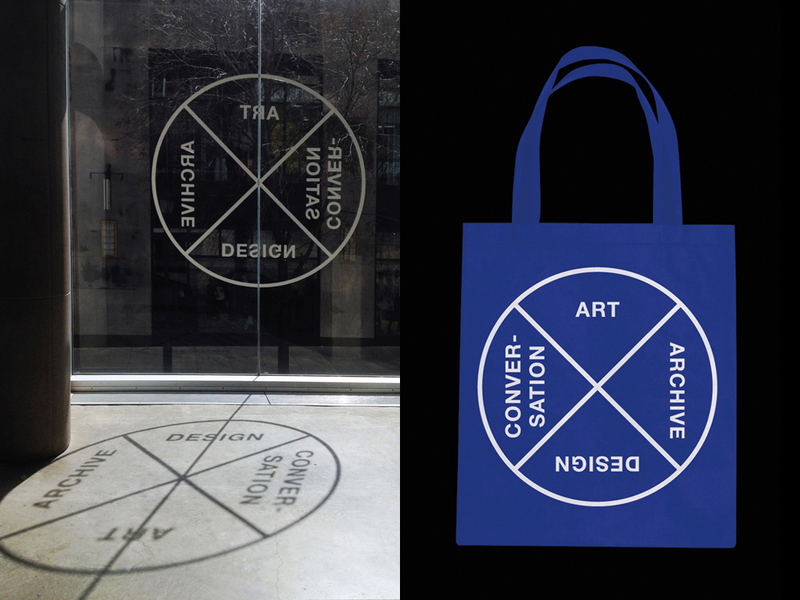 The mark itself appeared at a range of scales, including on gallery notes, print materials, and the ICA’s sidewalk sandwich board, as well as on tote bags, a flag hanging in the Ooga Booga space, and a large window graphic in Reference Library’s installation. In addition to the mark, an identity within the overall identity system was created for each of the individual iterations of the project. In each instance this was employed through a series of Riso-printed broadsides produced at PennDesign’s Common Press that announced upcoming events and through the color palette of the website. Each of the four modules were designed in consultation with the invited participants to reflect the aesthetic and ethos of each resident while also maintaining a consistency that sat next to but largely apart from the museum identity and website. In addition, the Risograph posters designed by Mark Owens and the WordPress website designed by Other Means meant that updates and announcements could be made relatively quickly and inexpensively and allowed for a kind of responsive design process that is rare within institutional settings. ICA has the distinct advantage of being located at the University of Pennsylvania, which gives the museum an immediate audience among students, faculty, and staff, as well as a proximity to the nearby neighborhood of West Philadelphia and close connections with the city’s broader artistic and academic communities. The responsive design process allowed for events to be conceived, organized, and advertised in a matter of weeks or even days, rather than the longer timeframes required for most museum programming. By the same token, the website functioned as an online residency, which allowed each of the participants to participate throughout the duration of their Excursus, long after their installation was complete. In this way, Excursus gained a following both among ICA’s local audience here in Philadelphia, and a much more dispersed audience who followed the project online. Of course, there is no substitute for the actual experience of visiting a museum, but taken together the printed material, website, and catalogue now serve as a both a record and an archive of the project. What were some of the most unexpected moments, and were they documented? One of the aims of Excursus was to explore questions of audience and exhibitionality in ways that could put some critical pressure on the terminology of “engagement” as it is currently being discussed in the broader cultural field. As a result, some of the most surprising moments occurred in the context of a “program” involving only two people, or in the unplanned interaction between participants. One instance that particularly stands out was the Madchester event organized by artists Anthony Campuzano and Dan Murphy in conjunction with Oooga Booga’s installation and the concurrent Jeremy Deller exhibition, Joy in People, which was then on view in the museum. Campuzano and Murphy led an afternoon discussion on fandom and their own teenage fascination with 1990s Britpop and the Manchester music scene centered around the famous Hacienda nightclub. Purely by chance, legendary Hacienda DJ Dave Haslam happened to be in town and had come by ICA to see the Deller show. Campuzano recognized him walking around the galleries, and was thrilled to have him participate in the conversation and offer his own first-hand accounts. The entire afternoon was documented and archived on the website, as were all of the events. Although the documentation is no substitute for the in-person experience we were very conscious of photographing the project along the way so that people could follow it from afar. Because there were so many events, participants, and archival materials, the website and publication have played a crucial role in making the connections between the projects more legible and ultimately as a new archival document. What was your guiding principle behind the presentation style of the catalogue? Why did you decide to go with the image-heavy, bit-like approach instead of a denser, text-heavy book? Excursus was a project with many moving parts, including four installations, archival material in flat files and vitrines, over 50 events, and more than one hundred participants. In order to make all of these components legible in a modest 128-page catalogue it made sense to atomize the elements and to separate them out. So, the documentation of each Excursus opens with a full-spread image of the space and is then divided into installation, archive, and event sections followed by a complete checklist. What results is a Whole Earth Catalogue-meets-Sky Mall page structure that both reflects the density of the material but also isolates each element and allows the reader to appreciate both the material quality and rich variety that resulted from each participants’ response to the Excursus prompt. Between the catalogue, the internet residencies, and any other archive of the project, what is your hope for the project in the future? Very much in keeping with the mission of ICA, Excursus was meant as a radical proposition and a provocation to probe the boundaries of the museum and to test what might be possible. As such, it required an enormous amount of effort and attention and by necessity demanded that it have a finite timeline. That said, Excursus‘s commitment to intimacy and flexibility, to questions posed by distribution and publication, and the successful occupation of an interstitial space in the museum, has infused some the current thinking at ICA and has led to other exhibitions and programmatic activities that might not have been possible otherwise. Going forward it is our hope that the website and the catalogue will remain as a record of the project and that it will spur continuing dialogue and encourage others to take up similar questions in new and exciting ways.